The brilliance of the fish is one thing, but add in some chips and what do you get? Click here to play! Pure excellence, that’s what. Savour the ocean in this wonderful slot for your chance at incredible cash jackpots. 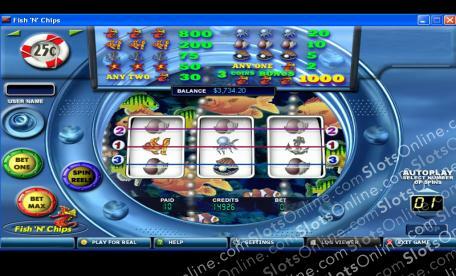 Fish-n-Chips is a jolly 3-reel slot played across 3 unique pay lines; open up more lines to allow for more winning combinations! There are no Wilds, Scatters, or Bonuses to distract you from the simple art of winning. Traditional slots come and go, but this classic is here to stay. Play well enough and you could see yourself earning a pay out of up to 1,000 times your original bet! With coins starting at 25c and reaching all the way up to $5, there is something for everyone at Fish-n-Chips.